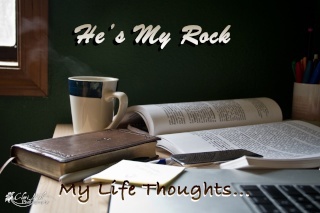 He's My Rock: What would you say? A few years ago I first heard the song, What Would You Say by Trailor Choir. That song got me thinking-a lot. What would I say if I only had a few minutes and a piece of paper to write a few thoughts? I have spent the years since trying to figure out what I would write. It just seems impossible to try to think of a few that I would I want to be my last. I thought of different ways I'd tell people I cared about them, who I cared about. I thought of different ways I would try to leave a note of encouragement, to encourage people to keep focused on Christ...but nothing seemed to satisfy that thought that I still really hadn't found what I would actually write. I was listening to this song again today, and it hit. I know what I would write. I wouldn't write to tell people how much they meant to me. If the first time they heard it came from a piece of paper, then I didn't live a life loving of Christ would. I should be living that out day to day. I wouldn't write an encouraging not to tell others to follow Christ, my life should be shining that out day to day. If the only way they knew how much I loved God and wanted them follow Him was from me writing it down, well I definitely hadn't been living life shining my light as a Christian in a dark world. I would want to write something to this effect, and mean it with all my heart: "I am ready. I have no regrets. Do not cry for me, rejoice! For I was a wretched sinner, but by the precious blood of Christ I have been saved. Rejoice. For God is faithful."